The combination of bacon, cheese and rosemary is irresistible, especially with oven-baked fish! 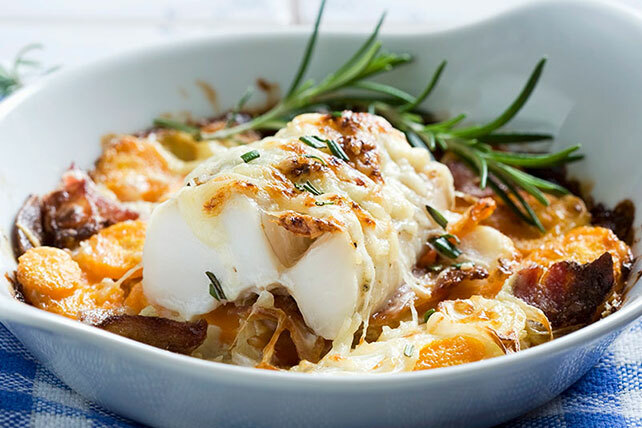 The smoky bacon and sharp cheese work perfectly with the mild but flakey cod. Let your guests be wowed by this delicious fish recipe! Heat dressing in large skillet on medium-low heat; add onions. Cook 15 min. or until onions are soft, stirring occasionally. Meanwhile, cook carrots in boiling water in large saucepan 2 to 3 min. or until crisp-tender; drain. Add carrots to skillet. Cook on medium heat 2 to 3 min., stirring frequently. Spray four oven-proof individual baking dishes with cooking spray. Divide vegetable mixture evenly into dishes. Place one piece of cod on top of vegetables in each dish; bake 14 to 17 min. or until cooked through. Sprinkle evenly with cheese and bacon in the last few min. ; let stand 5 min. before serving. Garnish with rosemary. Top each dish with a sprig of rosemary for an impressive presentation.